September at last brought cooler weather, but we’ve certainly had a summer this year! I hope we continue with a traditional mellow autumn. Maybe we will have a warm spell in October, called St Luke’s little summer – his day is October 18. And at the end of the month we will be into the start of winter by the old calendars, following All Saints’ Day. I’m often pleased by how well the Celtic trees fit in with what I would be writing about this month anyway. This month is a good example: the tree is blackthorn and the “secondary tree” associated with this time of year is ivy. 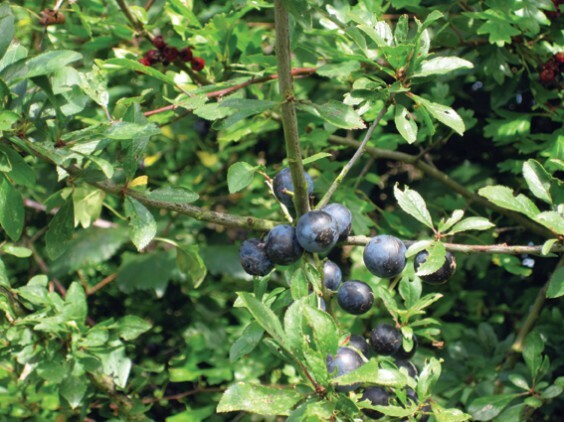 Blackthorn or sloe is a small tree but a really important part of our countryside and traditions. It is one of the plum family, with black twigs and fruit, and white blossom. In winter it looks very dark and its spiky thorns make it an impenetrable barrier. It was always much planted for hedging as well as growing wild. Blackthorn is not the first white blossom we see in the hedges in spring; that is the very early cherry-plum. But blackthorn is the first one that really covers the hedges in blossom and creates pathways for the bees and other spring insects. It flowers in March or April, about the same time as cultivated damson and plum trees, with small very bright white flowers in thick clusters. So long as there are not too many late frosts, the fruits follow, ripening much more slowly than cultivated plums. They are ripe about now, in October. Perhaps the word “ripe” is misleading with sloes. They stay very bitter and are almost impossible to eat raw. But they have always been used cooked, especially to flavour other sweeter fruit like apples. Some people say they are better after a frost, and you can often pick them into November. One of their main uses nowadays is in sloe gin and other liqueurs. This takes about two months to steep, so is always magically ready for Christmas. Two hundred years ago sloes were used steeped in water with a little cheap brandy to produce an imitation port wine. One of the interesting things about the plum family is that they can interbreed. As well as the blackthorn and cherry plum, we also have a wild native plum called bullace. This is a dark fruit, about the size of a damson but rounder. It can be quite sour but is definitely more edible than a sloe, and makes gorgeous jams and puddings. I know of three within walking distance of here. There are also of course orchard damsons and plums growing wild in the hedges. All these can interbreed with sloes. Because of this you may find blackthorn bushes with fewer thorns, larger flowers and juicier, slightly less bitter fruit. There are some around here, but people tend to keep their locations to themselves! Blackthorn wood is very hard and resilient and was much used for walking sticks, using the natural knottiness of the wood to make them ornamental. It was the wood traditionally used for Irish shillelaghs. The thorns are very sharp and can puncture tyres, so hedge trimmers need to clear up carefully after themselves. Blackthorn doesn’t seem to attract so much mythology as its relative the whitethorn or hawthorn. It appears a lot in medieval poetry and folksong, though, as a description of female beauty. Girls have skin as white as blackthorn blossom and eyes as black as sloes – including a famous one in Chaucer’s Canterbury Tales. It also appears in weather folklore. The period when it flowers can often be a cold one, and if there is a cold snap in March or April it has been for hundreds of years referred to as a “blackthorn winter” – the counterpart of St Luke’s summer. Black, white and red are colours found in many mythologies and religions. Blackthorn only has two of them, so it has the emblems of old age and death (black), and of youth and purity (white), but not the red symbols of maturity and passion. It is linked to the Celtic spirit in her guise as Brigid, the bride or young woman of spring and of the Imbolc festival, and with her older embodiment as the crone who presides over the period of Samhain, the autumn festival which brings us close to the dead. Samhain, of course, lives on in Christian times as Halloween/ All Saints’ Day at the end of October. Festivals of death, when autumn transitioned into winter, were not seen as sad affairs but as a way to connect with the people who had died but who were still present around us. So, blackthorn was seen mostly as a hopeful tree linking death and birth. Many folk songs and stories include mention of a “prickly bush” usually as a symbol of difficulty and hardship, and this was probably visualised as a blackthorn, forming its dark thickets. For most of us, it’s one of the beautiful signs of full spring when it whitens our road hedges and canalsides. The secondary tree for this time is ivy, which also has black berries. It is a special plant at this time because it is in flower when all other flowers have gone. It will be covered with late bees, butterflies and other insects especially if we are having a St Luke’s little summer. It is a symbol of tenacity and staying power because of the way it clings on to stronger trees and survives extremes of weather. It was often seen as a particularly female plant, unlike the masculine holly. The way it embraces trees, together with its evergreen nature, made it often used as an image for love. It is our only native evergreen climber. Ivy has a long association with alcoholic drink and was once believed to be able to cancel out the more harmful effects of alcohol. Drinking vessels were made of ivy wood. The ivy bush thus became a symbol for a tavern. Ivy was also seen as having various curative and protective properties for animals, especially cattle, and its presence ensured wholesome milk. It was used as a charm to take away warts and verrucas. Sometimes it was banned in churches because of its magical and alcoholic associations! There is disagreement about whether ivy damages the trees it grows up. It is not parasitic so doesn’t compete with the tree, and often lives in harmony with it. It doesn’t have to climb, and can grow along the ground, but finds trees handy as a scaffolding. However, ivy is very vigorous, and its sheer weight may damage a weakened tree. It covers deciduous trees with leaves in the winter, making them more susceptible to storm damage. But it doesn’t directly damage the tree itself. Ivy has often been used as decoration, made into wreaths (the young Queen Victoria wore a jewelled ivy wreath in her hair) or used because of the beauty of its leaf patterns. It was the most used plant for the Christmas wreath, often entwined with its partner the holly, and appears in carvings and ornamental metalwork, as well as being loved by flower-arrangers. It is beautiful all year round. Its flowers are vital for insects in autumn and its berries for birds in winter. A real magic plant! Here’s another magic plant: my poem linked to the Alvechurch Pumpkin Festival this October. Planted it under my window in the sun. Clutching the rose and climbing up the wall. And dying every day, but bright with hope. Bees and flies buzzed around it. But no fruit. Just sun after sun smiling and cheering loudly. Then one day, rain, and then a little swelling. I watched it grow to golf ball size and fall off. As big as plates, now clutching the tomato plants. Other just smiled as brightness entered them. Making me rewrite this poem as it grows. Is my pumpkin a marrow all the time? Who cares. Welcome whatever it is. Like life, having to be rewritten, every day.